Making a Zeus family tree is not the simplest thing in the world as it requires quite bit of research – especially in keeping track of all his countless extramarital escapades and consequent offspring. On this page I have made two examples of a family tree of Zeus that are easy for you to save on your computer and in high enough resolution to look good on print if you should feel like having the Greek god family trees on paper. 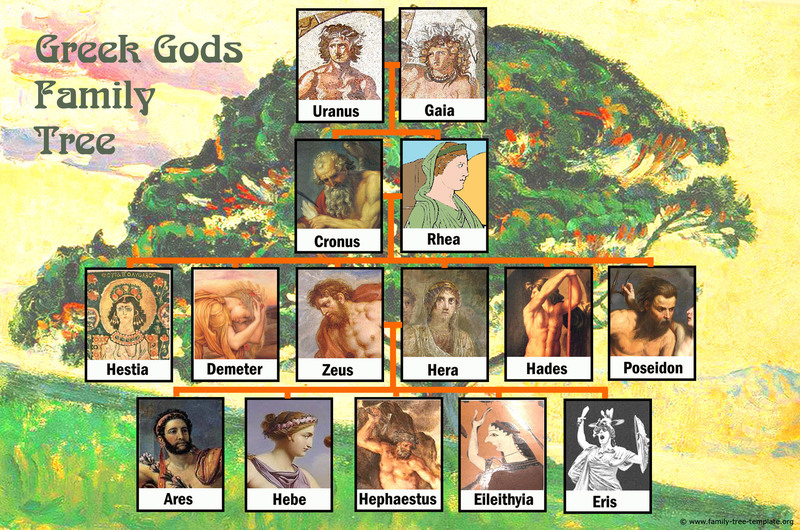 The above family tree of the Greek Gods 24,65 cm x 16,34 cm in 220 dpi. As you may already know Zeus was the ruler of the Greek order of gods called the Olympians that resided on Mount Olympus (other orders were primordial gods and Titans – you can see family trees including all the Greek orders of mythological gods on my other pages here and here). Besides being king of the Olympians, Zeus was god of the sky and thunder along with order and justice. You will often be able to recognize him in paintings as he is often depicted with a lightening bolt, a scepter, a bull or an eagle. 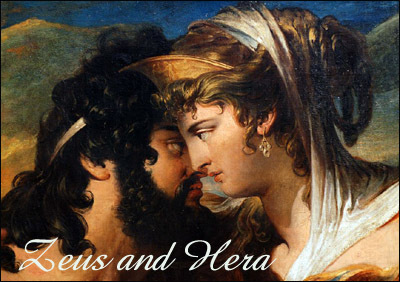 Zeus is married to his sister Hera with whom he had Ares, Hephaestus, Hebe, Eileithyia and Eris of which only Ares and Hephaestus are considered members of the 12 Olympians. Zeus’ parents Cronus and Rhea were of the older Titan order of gods. The order that Zeus beat in the great Titan war and the victory of which granted Zeus his position as ruler of the universe and the gods. Zeus was the youngest of his siblings and the story of his birth is quite special and reflects clearly the paranoia of the Greek male gods regarding being in power and ruling. Zeus’ father Cronus had several children (Hades, Hestia, Hera, Poseidon and Demeter) before Zeus. As Cronus had been told by his parents (Gaia and Uranus) that one his children would take over leadership from him, he got scared and decided to remove all threats and swallow all his children right after they were born. (Overthrowing one’s father as ruler already ran in the family as Cronus had already overthrown his own father Uranus.). However, Cronus’ wife Rhea was quite tired of having her children devoured by her husband every time she gave birth, so she sought counsel with her mother Gaia as to what to do and together they came up with a clever plan. Rhea was to go to Crete and give birth to Zeus and then cover up a stone in a blanket so that it would look like a baby swaddled up. Not paying too much attention Cronus swallowed the stone instead of Zeus. From the on Zeus lived hidden away in a cave raised by either a goat, Gaia, Amaltheia or a nymph (the sources can’t really agree on this). When Zeus was big and strong enough he confronted Cronus and forced him to disgorge the stone and his siblings. Together with his siblings and Zeus waged a war against his father and the other Titans. A war which he won, as I’ve already have mentioned. After the war was finished Zeus threw some the male Titans in a deep hellish pit called Tartarus. Now after the war Zeus and his two brothers Hades and Poseidon were all interested in ruling the world. So in order to make it fair, they decided to draw lots. Zeus was the lucky one and got to inherit the throne. Afterwards the world domains were divided between Zeus and his two brothers Hades and Poseidon. Not surprisingly Zeus got to rule over the sky, Poseidon the sea and Hades the underworld. Together they all ruled the earth. This complex Zeus family tree is 22 cm x 17,66 cm in 210 dpi. So far I’ve told you a bit about Zeus and his parents and siblings but the myth of good old Zeus doesn’t end here. Far from it in fact. The fertile Zeus was always on the lookout for new flings which almost always resulted in one or more children. Needless to say his wife Hera wasn’t too happy about Zeus’ many mistresses and tried to get back at several of them. Zeus didn’t really care whether his lovers were family or not, divine or not. Thus he had Athena via his cousin Metis, Apollo and Artemis via his other cousin Leto, Natura, Horae and Moirai via his aunt Themis, the muses via his other Mnemosyne, Persephone via his other sister Demeter, Zagreus and Melinoe via his daugther Persephone and apparently also Manes with his own grandmother Gaia. So as you can see Zeus kept himself quite busy. 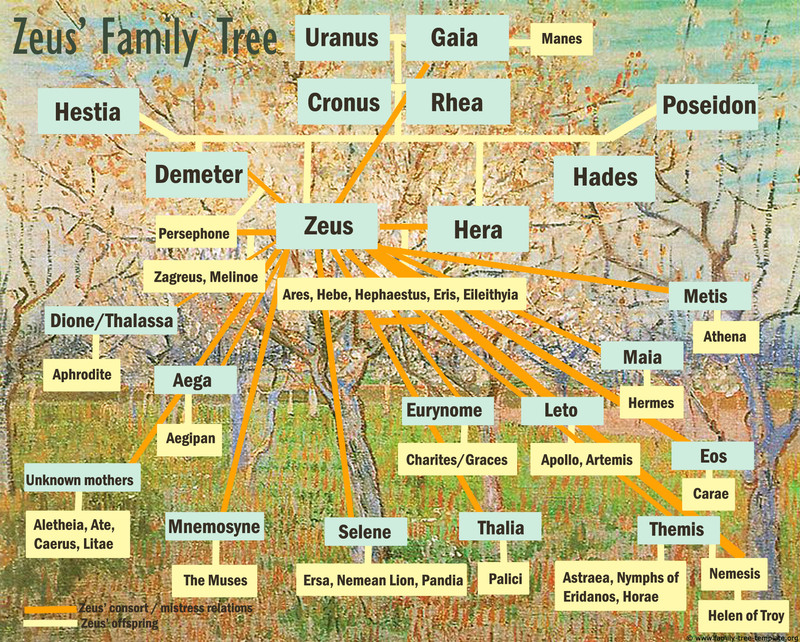 (If you wish to see a family tree where you can get a good visual of how Zeus is related to his mistresses, go to the Greek god family tree page. One of the mortals he had children with was Semele who gave him Dionysus.